From time to time, a pentomino tiling still manages to surprise me. 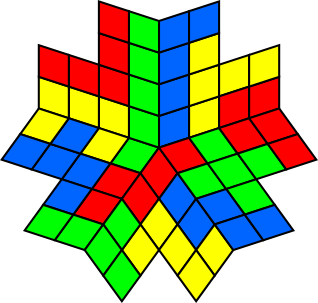 Normally, the largest number of symmetries you can make a pentomino tiling have is eight, the number of symmetries of the square. For example, we can tile an 8×8 square with the corner cells removed. (If we leave the plane for other topologies like cylinders and tori we can get more.) However, it’s a basic principle of flexible polyform tilings that we can generally try to squeeze one more repeated unit around the center of a rotationally symmetric tiling. So I did. It may be possible to find a good flexible tetrarhomb tiling, but I haven’t yet managed it. And 36 pentarhombs is too many for me to handle. If only there were some subset with a better number of pieces for a puzzle, something like the 12 pentominoes. This got me thinking of other five-fold layouts. I didn’t get anywhere with it, though. The basic shape I was considering was five 3*3 rhombi, plus L-trirhombi stretching between the outer edges of neighboring nonorhombi. If I’ve described it well enough, a little thought will show that there are other tilings for this shape’s outline, achievable by inverting areas with symmetric outlines. (These can probably be only hexagons, O-trirhombi here, but it’s easier to skip steps and use larger polygons.) So you could probably tile a grid that has fivefold rotational symmetry and a tenfold reflectively-symmetric outline. …oh. I took a while to post that comment, and hadn’t seen the update.